It?s hard to imagine now, when the National Hockey League has 30 teams and AHL sends hundreds of players up the ladder to the big show. But for 25 of its years ? the years many fans consider the Golden Era ? the NHL had but six teams. They were called the Original Six: the Montreal Canadiens, Toronto Maple Leafs, Chicago Blackhawks, Detroit Red Wings, New York Rangers and Boston Bruins. And while they were not professional hockey?s first teams, they were its only teams from 1942 to 1968. Such a small league meant opportunities for those laboring in the ?minor? league ? the AHL ? were slim. Few tales illustrate that better than Hall of Famer Johnny Bower?s. For nine seasons, the ?China Wall? guarded the net in Providence and for the Cleveland Barons. In 1953-54, he got his shot with the Rangers, playing in all 70 games and compiling a goals-against average of just 2.6. But that wasn?t enough. The next year, he came into camp 10 pounds overweight and lost the job to Gump Worsley. 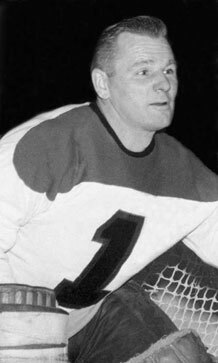 He spent the next six years bouncing between the AHL and NHL before landing back with the Maple Leafs in 1958 and staying there until 1970. And his arrival in Toronto meant the Maple Leafs had no room to bring up a young goaltender named Gerry Cheevers. In a 2002 interview with the Hockey Hall of Fame, Bower said he felt that, in terms of talent, the NHL and AHL, ?were very close at that time. The NHL had sponsorship with teams in the American league and they often sent top-notch players down to the minors. At one time Cleveland tried to get into the NHL and no one said anything about not being good enough." "When you played in the American league," he said, "you just had to be patient, wait your turn for a rebuilding team. A lot of good goalies came out of our league, too." They certainly did. At one time or another, Worsley, Frank Brimsek and Eddie Giacomin tended net for the Reds. There?s a lot of talk about how expansion teams, in any sport, dilute talent; about how the stars of yesteryear?s minor leagues would be major league standouts if they played today. There?s equally as much talk about how better equipment, better training and better development have raised the ability of all of today?s players. Fact is, we?ll never know how Zellio Toppazzini would have fared playing in today?s 30-team NHL. 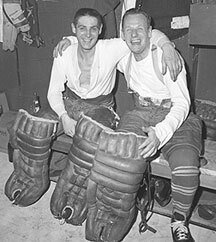 Terry Sawchuk, left, and Johnny Bower combined to defend the Maple Leafs goal from 1955 to 1957. It took Bower, who started with the Rhode Island Reds, 13 seasons to find a permanent home in the NHL.